Aloo Gobi Masala is quite a popular & filling vegetarian dish, not just in India, but recently globally as well. 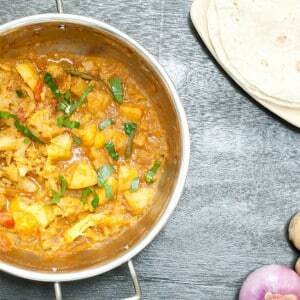 The vegetarian curry includes potato and cauliflower, making it a delicious spiced meal for any Indian food lover! I always make sure to include pure veg Indian dishes into my weekly menu plan. You can imagine the upside of eating veggies of course, we all know that they are good for us. As a meat lover I find it difficult at times to completely enjoy veggies when they are just plainly cooked without much flavor additions. That’s why I tend to enjoy a dish such as this easy spiced Aloo Gobi Masala. Veggies cooked in a spicy gravy such as a curry can convince you that eating vegetables can be pure pleasure. Some cumin here, some garlic there, a pinch of yellow turmeric to brighten the dish and a handful of fresh herbs to finish it. You can manipulate the seasoning of vegetables with spices in countless ways and let your creativity flow. That’s what I do and sometimes the result is a taste pleasure but I do have to confess that I had my bad seasoning days in the past, especially at the beginning when I tried using more and more new and unknown spices. I made mistakes but learned of them, adjusted the flavors until we were convinced that the flavor was satisfying our hunger for dinner. If a new dish turned out exceptionally well I would post it here, as I have been doing since 2011, such as this aloo gobi masala – potato cauliflower curry. Sometimes instead of using different spices I would prefer to rely on a spice blend mixture (masala). It saves time and comes handy. Popular spice blend types include Garam Masala, Tandoori Masala, Chole Masala, Chaat Masala, Meat Masala, Kitchen Kind and Curry powder. In today’s aloo gobi masala you will find Curry powder, which is one of the most popular spice blends in the Western world. The German’s use it in their Curry Sausage, the french in their mayonnaise. In India, curry powder is absolutely not present in any traditional dish what so ever! In fact I only found one shop, who sells ready made curry powder in North Goa, I am sure there should be more, but to be honest it’s still nothing compared to Europe. In Europe you can see everywhere curry powder, in all shops, it is quite popular. I enjoy curry powder too so I created my own, which I posted here. It’s so easy to make your own curry powder at home and it can save you so much food preparation time while providing a great flavor experience. I think you should try it some time and then make this aloo gobi masala. It will take you about 25 minutes all together to prepare and cook this dish, saving you effort and time after a long day at work. My Aloo Gobi Masala is a one-Pot, quick and easy, vegetarian, gluten-free and nut-free curry dish! See below the printable recipe for serving suggestions. Super easy weeknight curry dinner made from scratch within 20 minutes with curry powder. Nut-free, Gluten-free & Vegetarian nutritious meal, lightly spiced and not too hot. 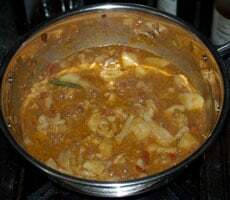 Use a shallow pan such as a small wok or an Indian Kadai. Peel, rinse and quarter your potatoes. Rinse and cut the cauliflower florets. Cook potatoes and cauliflower until soft. In the meantime, slice your onion and dice your tomato. rinse and slit your chili lengthwise. Add some Olive oil to the pan and stir fry the onion and chili until the onion is translucent. Cooking the chili at this stage will reduce some of the heat. Add the tomatoes and ginger garlic paste, stir fry. Then add the seasoning, turmeric, curry powder, salt and pepper. Stir fry all this for a minute, the spices should not burn. Then add the tomato paste and cream, mix well. Continue to add in the veg stock or water and the previously cooked potato and cauliflower, mix well and cook for 5-10 minutes. garnish with fresh coriander. See serving suggestions in the post below. Dear Reader, how often do you eat a pure vegetarian dish in a week? It is funny how “curry powder” isn’t used by Indians at all. I don’t ever use curry powder in my Indian dishes and neither did my mother. Now, when I want to make a British Indian dish, I break out the curry powder blend. In my everyday Indian cooking, it’s usually just cumin, coriander, turmeric and chilli powder. Aloo gobi is one of my favourite dishes made with cauliflower. I’ve never used curry powder in it, but sounds intriguing. I will try it that way for sure next time, it looks wonderful! I love this dish! One of the first Indian recipes I ever tasted, and still one of my favorites. Yours is a great version — simple, but good flavor. Good stuff — thanks. You sure are right, Helen – vegetables cooked in a curry are a pure pleasure to eat! -Just like this! Growing up, if my mom hadn’t made curries for every vegetable I ate – I don’t think I would love veggies as much as I do now! A tasty and healthy curry! Wonderful. 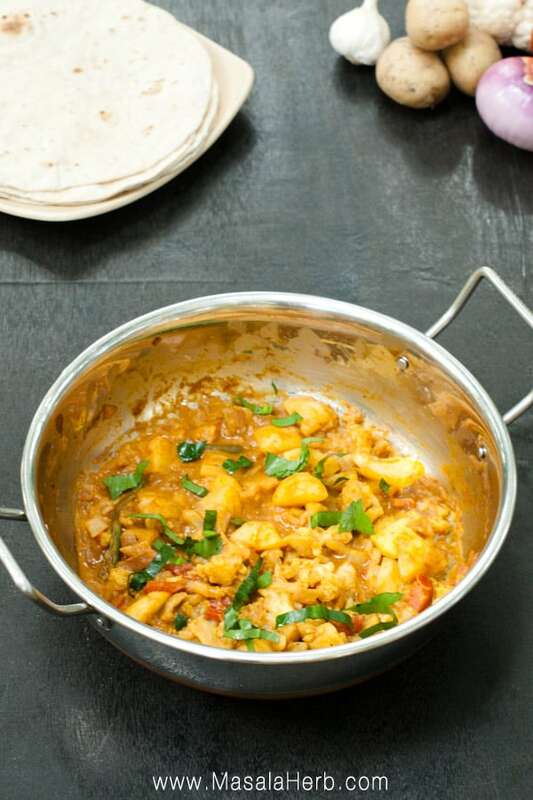 Your cauliflower curry looks very tasty and comforting! Now THIS is mind kind of food! I do not know how to “cook” Indian very well, in that I could not make up a recipe, I need to follow one. THIS is one I will be following! YUMMO!! 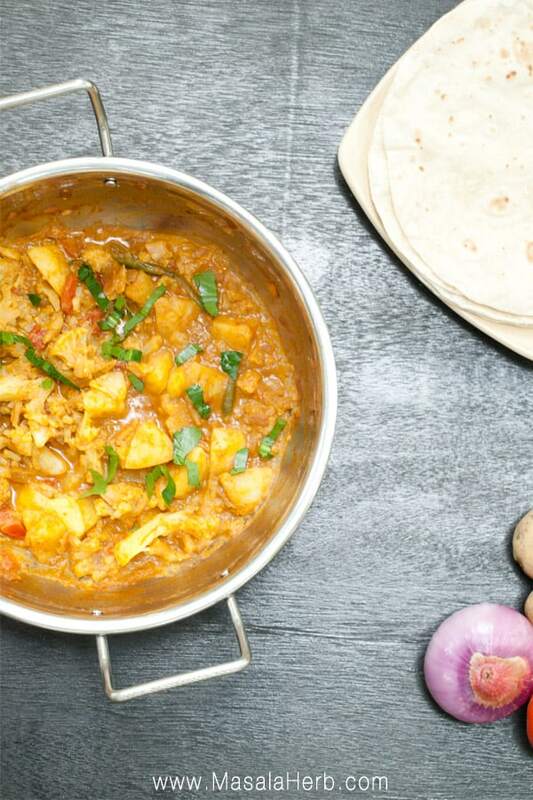 I’ve never made a vegetarian curry but I certainly want to after reading this post. You bet! Spices can indeed do wonders to any vegetarian dish and the best part is they need just a little bit to bring out the best in them. 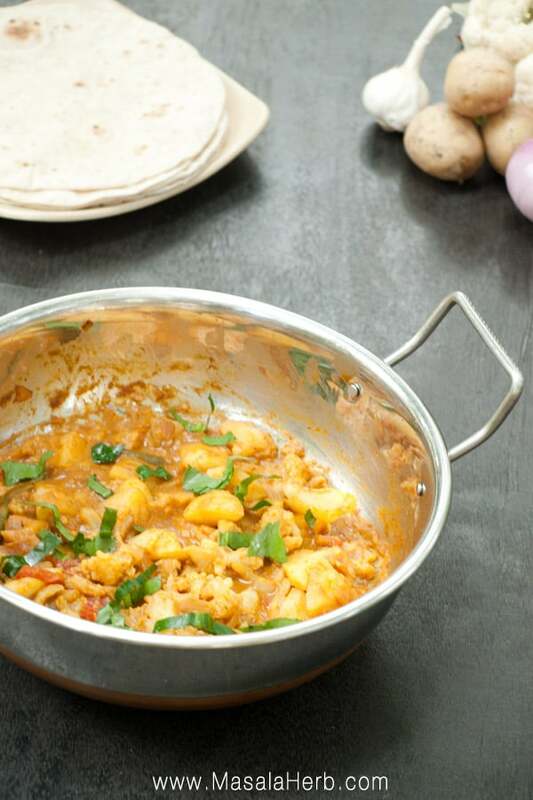 Alu Gobhi tastes best when it is a bit on the spicier side in an Indian style curry. I make Aloo Gobi at least once in a month. It is so easy to make. Nice recipe..
Like all Indians, I don’t use curry powder, but they do come in handy. It’s much like ready made garam masala. While it’s OK to use them, nothing like a fresh blend. The gobi looks so flavorful and well done. I can polish that entire bartan on my own. This is a lovely recipe, Helene… perfect flavour combination… I think my son might like this very much! Thank you. ooh this looks amazing, can’t wait to try! I never buy curry powder mixes, although I’m pretty sure there are some new spice blends that are much improved from the ones available at the supermarket. I make up my own, which has a lot of heat. As a vegan, I LOVE almost all veggies & yes, they are usually, but not always, improved by a little seasoning, even if it’s only salt. I do have to point out, I doubt many people would eat much meat if the taste wasn’t almost completely altered by seasoning. So glad you re-posted this Helene – this is my idea of comfort food – love all the spices that marry that potato and cauliflower so well together! I love curry! I haven’t tried making it as much at home as I should. Thanks for the recipe! Thanks for such complete instructions! They make this recipe so easy to follow! one of my fave Indian curries – love this! I love eating aloo ghobi but my mom’s recipe sounds super complicated. This is just what I’m looking for, easy and duper delicious! I’ll be making this in the next few days. Thank you! I find that so interesting that you can’t find curry powder in India! I had no idea. SO pretty and vibrant! I am not familiar with this dish but I want to be reading through the ingredients and others comments! There’s nothing bland or boring about this recipe! Thanks for sharing it! This looks fab!!! I love the flavors in it!!! I am so gonna make this tomorrow, as Mondays we eat vegetarian and I always have to figure out some ideas to cook something delicious. Thanks for the recipe. Looks great! One of my fav dishes; I may try to make at home. Do you know any substitutes for the cream, to make this vegan? (My brother is very sensitive to milk products.) Thanks! Hi Amy, you could try using coconut cream instead. Coconut milk is liquid, the cream isn’t. Hi, this may be interesting you: Easy Aloo Gobi Masala!